Lost&found. What must I do if I lost my IDcard of UV? The maximum reserve for a reading place is 30 minutes. Where is the borrowing service? On the ground floor, on the borrowing desk and the self-service machine, that is available during 24h opening periods from 8:30pm to 8:30 am. 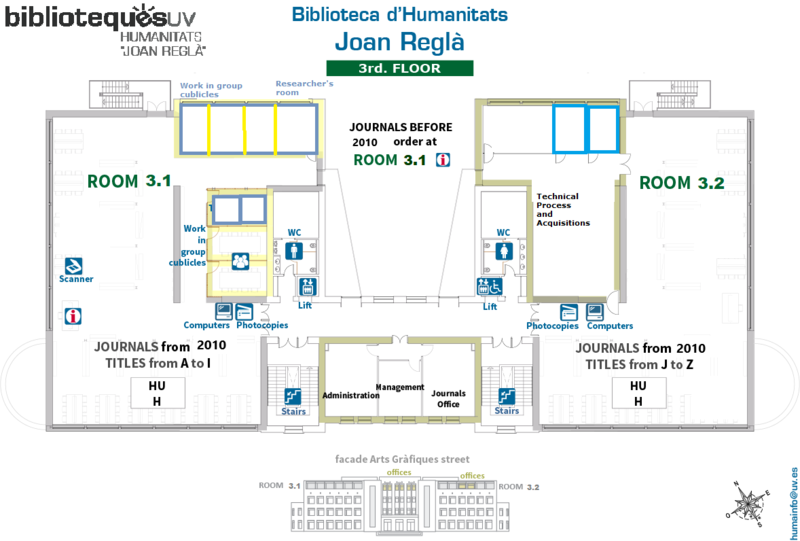 Laptops are lent in room 6 (floor 1) and thesis are consulted in room 9. Desk loan service closes half and an hour before the library. The photocopiers are in the hallways of all floors (ground, 1, 2 and 3). There are coin-operated photocopiers (which do not give change) and photocopiers operated by a card obtained in the reprography services of Geography&History Faculty. You can print documents through reprography of Geography&History Faculty from any computer in the Library and for the same price as a copy. You have to click on the "Aplicacions Windows" icon you''ve just logged. They will be printed when you go to pick them up at Faculty. Provision of digitized printed articles that are in the UV libraries but that there is no electronic version: application (limited to research purposes, only for PDI, PAS and postgraduate students). The scanners are in the rooms 6, 12 and 17 (floors 1, 2 and 3 respectively). Cloud data storing is available in http://disco.uv.es (also accessible from the university login screen, under the option “file browser”) too in https://nube.uv.es/index.html.en althoug it's permitted for PDI and PAS. Where do I request documents? HU D0 in the loan desk (ground floor). HU D1 in the room 6 (1st). HU D2 and HU PH in the room 12 (2nd). Journals before 1998 and weekly publications in room 17 (3rd). You must fill in a ticket to request them. The books in the Deposit Library (holding BID) are located in the basement of the Tarongers Library, but they are requested through the catalogue, from "My Account". Where are the computers (requiring user and password of the UV e-mail)? - Ground floor: Room 2. 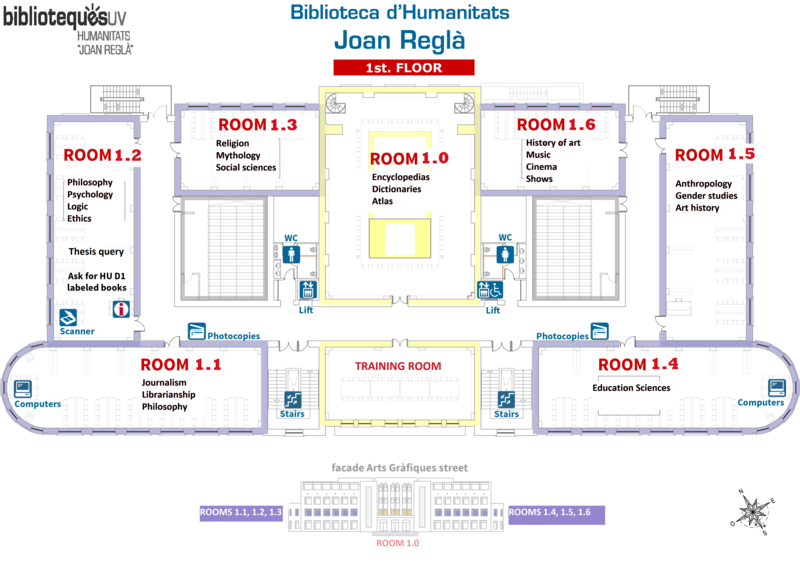 - First floor: Rooms 5 and 8. - Second floor: Room 11. - Third floor: 17 and 18. There is a height-adjusted computer in room 3. Laptop loan in room 6 (1 floor), usage rules. Where is the user training room and how do I use it? Where are the staff offices? 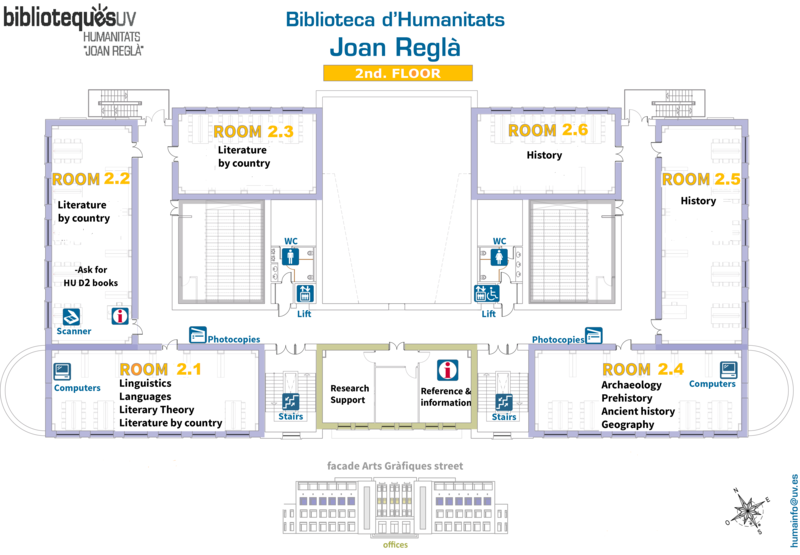 Bibliographical Information and Research Support on the 2nd floor. Administration, Technical Process, Management, Newspaper Library, Borrowings and Acquisitions on the 3rd floor. Where are the group work zones? On the 3rd floor, room 17. You must request the key for the microform reader or digitiser to the researchers' room. Where are the adapteded computers? 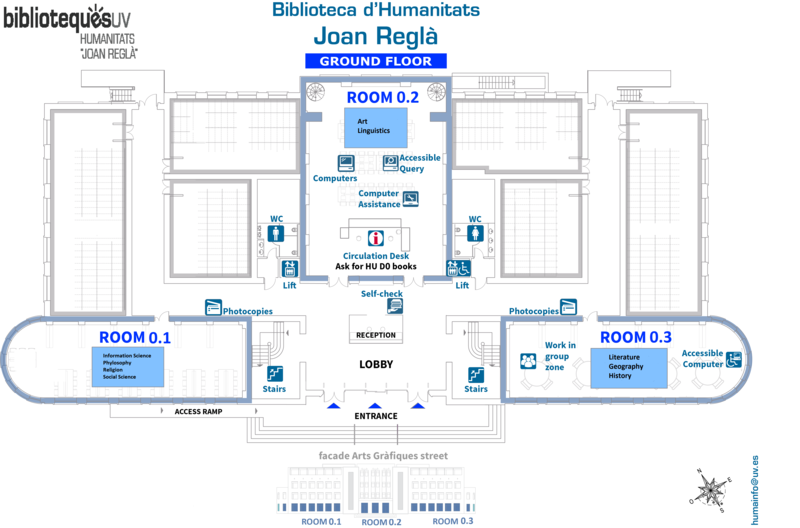 On the ground floor there is a computer with a scanner adapted to sight impairment (room 2) and another adapted to wheelchairs (room 3). Also Jaws, ZoomText, DragonDict and AbbyFineReader applications are installed. In all rooms there is a height-adjustable table. You can also request a wheelchair in the loan desk (room 2). Where is the "lost and found!. What must I do if I lost my ID card of UV? It is very important that if you lose the ID card UV you notify the library immediately to prevent supplanting your identity, and also ask the new one to Secretary of your faculty. At the entrance of the library, ground floor, is the Conciergerie, where lost things are kept. Where is the map library? On the first floor of the Faculty of Geography and History. More information. Where is computer assistance, how to configure vpn...? -virtually: through the email website clicking on the Information Systems Incidences option, available the 24 hours.